Description: The Mycelium Bar is stretched after the knots are tied, allowing you to see the diagonal and horizontal branching. It's quite interesting. 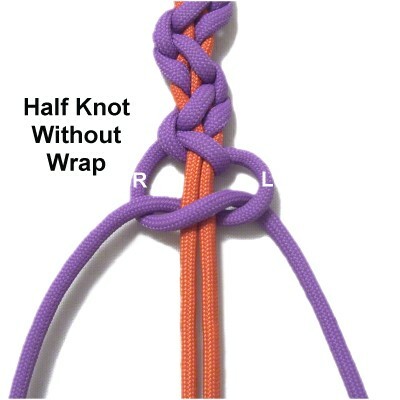 You will be tying a series of Half Knots with extra folds. 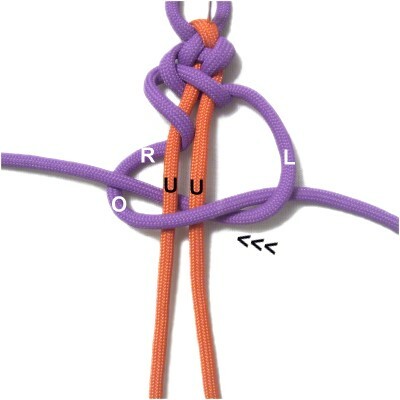 Because these knots are tied in both directions, Square knots are formed. 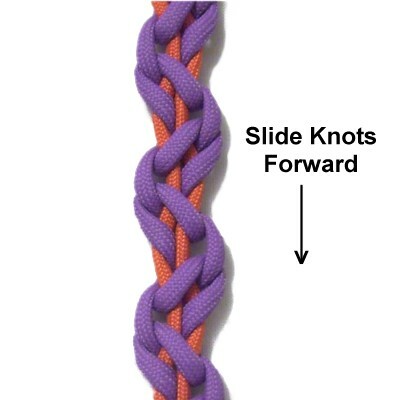 This decorative knot is perfect for Paracord bracelets, Macrame belts, and other projects where you need a long, slender knot design. The instructions below include a loop at one end. 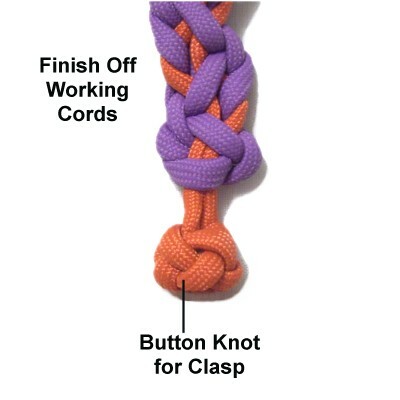 At the opposite end a button, bead or button knot can be placed to form a clasp. 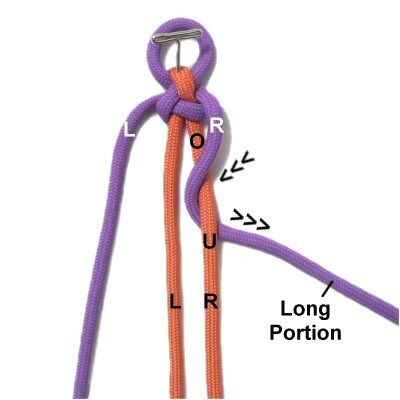 Paracord was used in the instructions shown. Be sure to read the bottom section of Cord Preparation to find out how to treat the tips to prepare and finish the cords, if you plan to use this material. 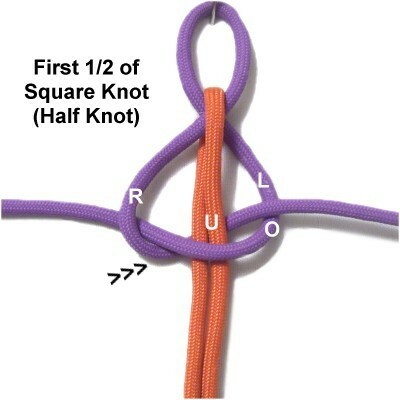 I found this knot on the Fusion Knots website. The video gallery has this design under the name Branching Mycelium Bar. To practice the Mycelium Bar, you need two cords in contrasting colors, each at least 60 inches long. 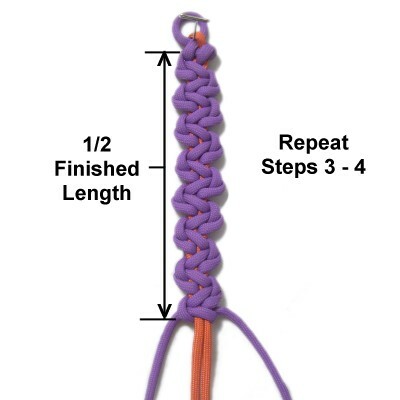 When using this decorative knot in a Macrame project, the length of the working cord (A) should be 8 x the finished length of the item you plan to make. Cord B should be 2 x the finished length + 8 inches. This gives you enough material to tie a button knot for a clasp. 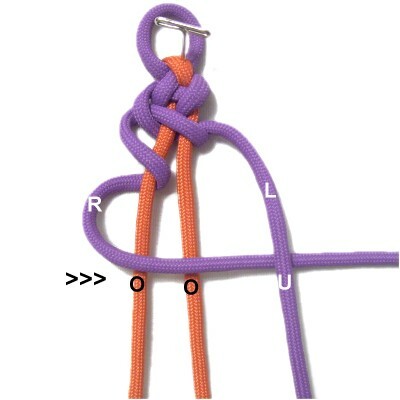 The loop design below is optional if you prefer to simply fold the cords, or if other knots have been tied. The right portion of the cord should contain 2/3 of the material. The left portion should be 1/3 of the total length. 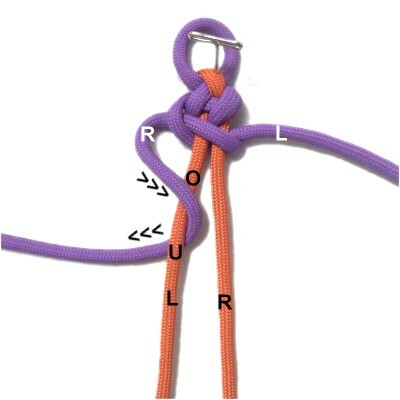 Fold cord B in half and arrange it around the crossing point of the loop, so the right half passes over the front of it. The left half should rest underneath it. Step 2: Move the left portion of working cord A to the left, passing over cord B and under the right half of cord A. Move the right portion of cord A to the right, passing under cord B and over the left half of cord A. This is a Half knot, which is similar to what you will be tying for the remainder of the Mycelium Bar. 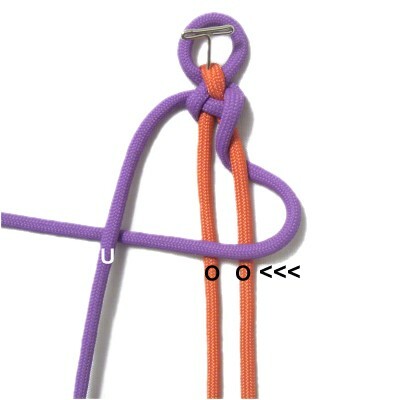 Tighten the knot firmly, and adjust the size of the loop so it's appropriate for your project. Step 3: Mentally label the two halves of cord B right and left. Secure them with tension. Wrap the long portion of cord A (right) over - under the right half of cord B. The arrows show the direction the cord should move. 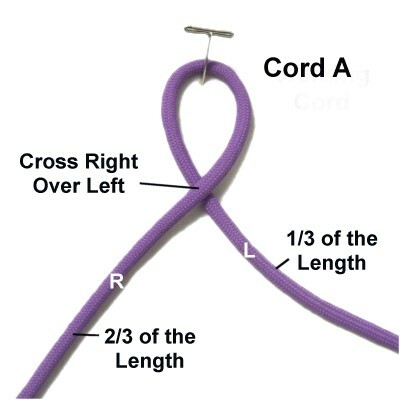 Fold the right portion of cord A to the left, passing over both halves of cord B and under the left portion of cord A. Move the left portion of cord A to the right, passing it under both halves of cord B, and over the right portion of cord A. 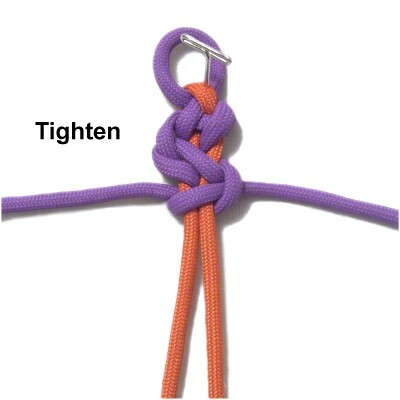 Tighten the Half Knot completely, but make sure it can still be moved. You will be stretching the knots apart later on. Step 4: Use the right portion of cord A again, which is now on the left. Wrap it over - under the left half of cord B. Move the right portion of cord A to the right, passing over both halves of cord B and under the left portion of cord A. 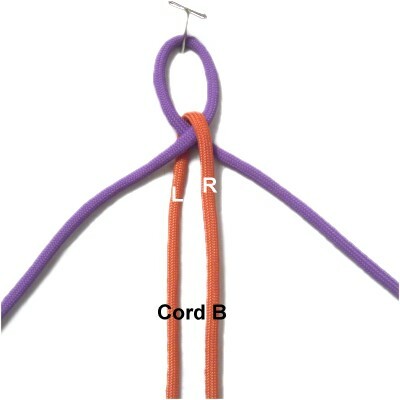 Move the left portion of cord A to the left, passing under both halves of cord B and over the right portion of cord A. Tighten the Half Knot completely, making sure it can still move. Step 5: Repeat steps 3 - 4 several times, until the sennit is 1/2 the finished length you wish to make. Important: Do not include the loop when you measure. Step 6: Make sure the Mycelium Bar is secured well near the loop. 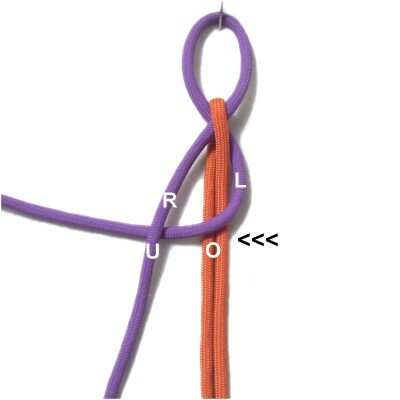 Separate the knots by sliding them forward, which is towards the front of your board. Stop when the sennit is the finished size you want. Include the loop when you measure. Designer's Tip: You can only stretch the knots so far. 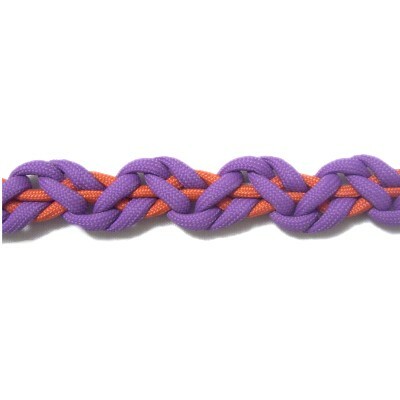 So you may need to add or remove knots after you separate them, in order to get the finished length you want. 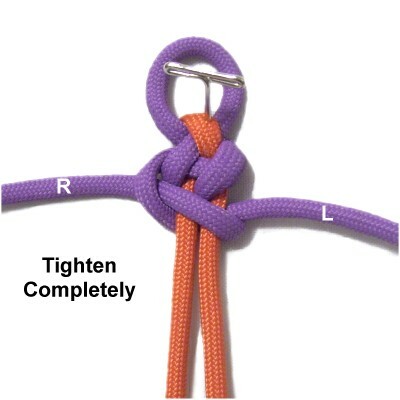 Step 7: Secure the bar by tying a regular Half knot (without the wrap). Step 8: Finish off the working cords (A) by securing them to the BACK of the sennit. 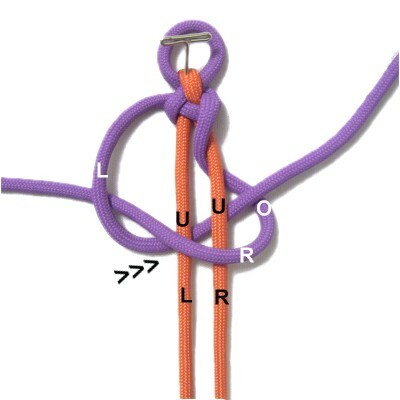 You can tie a button knot with both halves of cord B if you need one for a clasp. The one shown is the Knife Knot. Have any comments about the Mycelium Bar? Contact Me.